A must for bowlers who use a walking stick on the lawn. 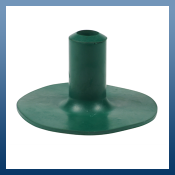 Proven aid for use on indoor and outdoor greens, and in many cases mandatory. For metal, wooden & collapsable sticks. 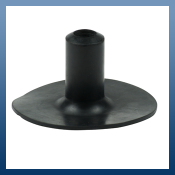 Extra large flexible circular base makes these ferrules ideal for walking on grass whilst minimising indentations and damage to the surface. Available in black or green colour and in 19mm (3/4") and 22mm (7/8") sizes, which are suitable for metal and wooden walking canes respectively. Easy push on fitting.